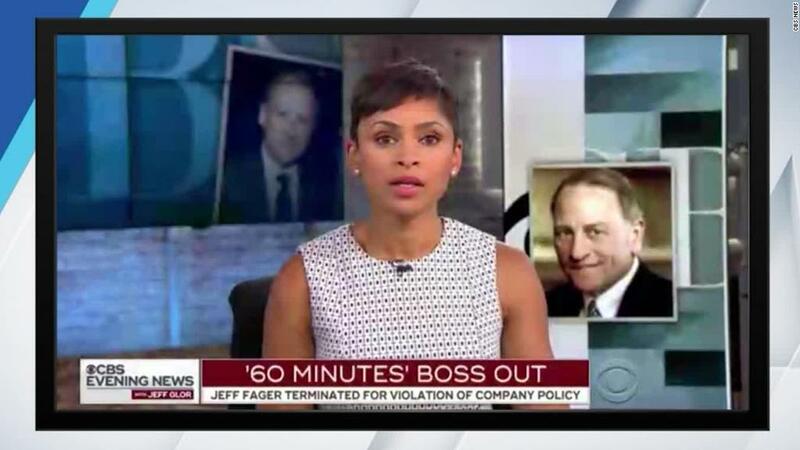 Jeff Fager, the veteran executive producer of "60 Minutes," was fired on Wednesday amid accusations of inappropriate conduct at the acclaimed newsmagazine. The announcement roiled CBS News and came right on the heels of CBS CEO Les Moonves' exit from the company. Moonves and Fager were the subjects of a recent investigation by Ronan Farrow of The New Yorker into sexual misconduct at CBS. But Rhodes said in his memo that "this action today is not directly related to the allegations surfaced in press reports, which continue to be investigated independently. However, he violated company policy and it is our commitment to uphold those policies at every level." The specific violation involved a text message that Fager sent to Jericka Duncan, one of the CBS reporters who has been covering the fallout from Farrow's reporting. Questions about Fager's future at the network had been swirling ever since Farrow's first story came out. The allegations against Fager included unwanted touching. He staunchly denied the accusations. The scrutiny intensified on Sunday, when Farrow published a second story. Moonves stepped down later that day. So Duncan reached out to Fager for comment, and he responded with a menacing message. Fager, in a statement to CNN, said the text was a demand that "she be fair in covering the story." "My language was harsh and, despite the fact that journalists receive harsh demands for fairness all the time, CBS did not like it," he said. "One such note should not result in termination after 36 years, but it did." Fager's statement prompted Duncan to share the text on Wednesday's "CBS Evening News." "Be careful," he wrote to her. "There are people who lost their jobs trying to harm me, and if you pass on these damaging claims without your own reporting to back them up, that will become a serious problem." At the end of Duncan's report, anchor Jeff Glor said to her, "That message was unacceptable. I think it's important for you to know... that the entire team at Evening News supports you 100%." Steve Kroft, a veteran correspondent on "60 Minutes," told CNN, "Over the years Jeff Fager has done a remarkable job managing '60 Minutes,' but the text message to Jericka Duncan was threatening and inappropriate. This whole situation saddens me deeply." A representative for Fager said he had no further comment on Wednesday night. As Kroft's remark suggests, there is a palpable sense of sadness within CBS News. There's also some anger and apprehension. "60 Minutes" is one of the most revered programs in television news. Staffers are are fiercely protective of the newsmagazine. With Fager out, they are worried about its future. Rhodes said that Fager's longtime No. 2, Bill Owens, will manage the newsmagazine while a search is underway "for a new executive producer of the program." And Rhodes pointedly invoked the name of the company's new acting CEO, Joe Ianniello. He said "Ianniello is in full support of this decision and the transition to come." When Farrow's story came out in July, Fager said Farrow's sources — a "few people," he claimed — had an "axe to grind." But Farrow had numerous sources, including six former employees who said that "Fager, while inebriated at company parties, would touch employees in ways that made them uncomfortable." Farrow also cited "nineteen current and former employees" who said Fager "allowed harassment in the division." In the same story, Farrow published the initial allegations of harassment and assault by Moonves. Both men were defiant after the story was published. They remained in their positions while law firms hired by CBS investigated the allegations. Farrow continued reporting. He heard from additional women who lodged serious accusations against Moonves. Farrow's follow-up story, published on Sunday, also included a new allegation against Fager. Moonves had already been in exit talks with CBS. By the end of the day on Sunday, he was officially out as CEO. Sources at CBS News said there was a consensus that the network couldn't take action in the Fager case until the Moonves case was settled. After all, Moonves was the ultimate boss. Now, within a matter of days, both men have departed the network. Their exits follow Charlie Rose, the former co-host of "CBS This Morning." Glor pointed this out on Wednesday's newscast: "In less than a year," he said, "three of the most powerful men in broadcasting" -- Fager, Moonves and Rose -- "all accused of sexual misconduct, have either been fired or resigned."